Just two days before Kinder Morgan’s May 31 deadline for reassurances from the federal government that the Trans Mountain pipeline expansion could be built, Ottawa announced Tuesday that it will buy the contentious project from the Houston-based energy infrastructure giant for $4.5 billion. The extraordinary move by the Canadian government to push ahead with the crucial pipeline has drawn strong reactions from across the country. Here’s a look at how guests on BNN Bloomberg are reacting to the Trudeau government’s decision and how they think this pipeline saga will now play out. Aaron Wudrick, federal director of the Canadian Taxpayers Federation, tells BNN Bloomberg the decision by Ottawa to buy the Trans Mountain pipeline will come at a "massive" expense to the taxpayer. He says he would have liked to see them exhaust all other options first. Eric Nuttall, senior portfolio manager at Ninepoint Partners, reacts to the federal government's announcement that it will be buying the controversial Trans Mountain pipeline from Kinder Morgan Canada. BNN Bloomberg speaks with John Risley, president of CFFI Ventures, to get the perspective of a business leader from Atlantic Canada. 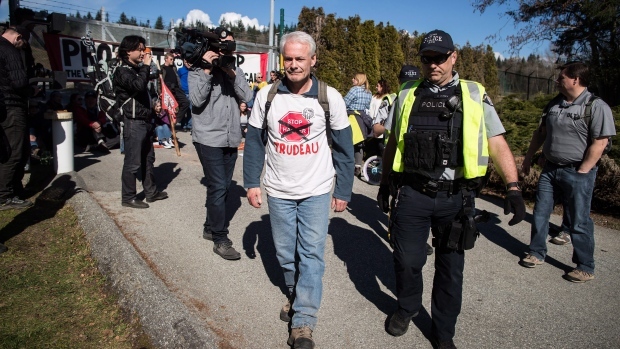 While he applauds Ottawa's decision to save the Trans Mountain pipeline, he worries about the future of other infrastructure projects getting approval in this country. Frank McKenna, deputy chairman of TD Bank and former Canadian ambassador to the U.S.
Frank McKenna, deputy chairman at TD Bank and former New Brunswick premier, is applauding Ottawa's decision to purchase the Trans Mountain pipeline. He says the government is showing leadership and sending a signal to the international community that "it can rely on Canada to get things done." Jim Carter, member of Alberta's Market Access Task Force, joins BNN Bloomberg for his take on the federal government's announcement it's purchasing the Trans Mountain pipeline. He says he's pleased with the decision and that it's an important step towards getting his province's oil to tidewater. Norman Levine, managing director, Portfolio Management Corp.
Gwyn Morgan, former CEO, Encana Corp.
Gwyn Morgan, former CEO of Encana, joins BNN Bloomberg to provide perspective on Ottawa's decision to buy Trans Mountain. When it comes to international investor confidence in this country, he says that this move is, "too little, too late."